I'm on a skillet kick here lately (check out my skillet cookie here). I think food served right from a cast iron skillet looks homey, rustic and fun. BTW, I found my Lodge skillet at Home Goods a while back. They're inexpensive. So if you don't have a cast iron skillet, you should check your local TJ Maxx, Home Goods, Marshalls, etc. I know I paid less than $20 for mine. 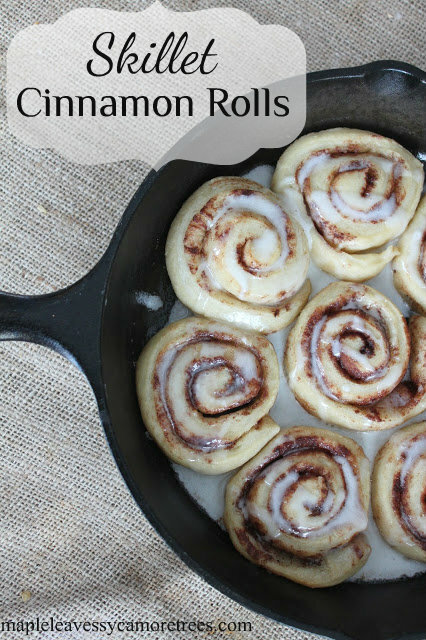 But don't fret, if you don't have a skillet and you're hankerin' for some sweet cinnamon rolls, you can make these in any typical pan (9x13 is just fine). I need a show of hands--how many of you made my homemade bread recipe?? I know there's at least one of you out there 'cause my friend Lauren (a blog reader) told me she made it and she said it was bangin'. If you haven't conquered your fear of working with yeast yet, you should totally try slayin' that dragon by making the bread. It's seriously good. Then you'll have enough dough left over to make these super easy cinnamon rolls. And you'll love me forever. Then introduce it to my favorite side--butter. And yes, if you use it like I do, it's considered a side. Then sprinkle cinnamon on top of that. From here, you just slice the dough into like 3/4" pieces. Butter your skillet up. I used about a tablespoon. Arrange your dough around inside of skillet. Bake at 350 for about 20-25 min. Make up a simple frosting by taking powdered sugar and adding a dab of milk to it until you reach your desired consistency. Drizzle over warm rolls. Kid-tested. And they passed the test. Roll out the dough into a rectangle onto lightly-floured surface. Spread with 3 tablespoons softened butter, leaving about a 1/2" all around the edges. Sprinkle with granulated sugar, then cinnamon. Roll dough into a tight log. Use sharp serrated knife to cut the dough into 3/4" pieces. Arrange in skillet or pan and bake for 20-25 minutes. While rolls are baking, make up glaze for top of finished rolls. Start with about 1/4 cup of powdered sugar and add a bit of milk until desired consistency is achieved. (If it's too runny, just add more powdered sugar to it). Pour glaze on top of warm rolls. I got about 20 rolls out of my batch. So glad you liked the skillet cookie! Making that is becoming a weekend tradition here at our house;) As for the flour--I used half of a 5 lb bag (which I think is a normal-sized bag of flour). I just eyeball it and work it with my hands--you'll be able to feel when it's right. If it's too wet, just add more flour to it. You really can't mess it up. And once you make it once, you'll know what I mean. The only difference is that the King Arthur flour I use (which you can find at pretty much any store) isn't bleached. But other than that, you can use whatever flour you prefer. Hope that helps! OK- you've done it again! Cinnamon Rolls for dessert tonight! And, by the way, I DID bake the bread, that rose in the kitchen, that was delicious! Amazing photo's!!!! Yay! Glad you liked it, Cheryl! I can't wait to try these. I love any excuse to use my cast iron skillet. Ooh! I'm liking the "Pin it" button on all the photos! How handy.